Pansies and violas are the bookends of the outdoor gardening season. I plant them first thing in the spring and last thing in the fall. Pansies are the genesis and exodus of the gardening season. Pansies bring a garden full circle, bridging Spring to Fall. Pansies come into my garden with the tide of Spring, go out with the tide of Summer, and come back in with the tide of Fall. They don’t like the summer time. Pansies are the perfect caterer of the garden; they arrive early in Spring to help get the garden party started, then step aside to let others enjoy the garden in summer, and later return in the Fall to help with clean up. Spring into pansies at the beginning of the gardening season and then Fall back on them at the end of the gardening season. Pansies are the appetizers of Spring, the first course of a garden dinner, and then return as the dessert of Fall, as the garden dinner winds down. Pansies are a most welcome garden guest in both Spring and Fall. Like a slow moving train, the engine of pansies rolls into town every Spring, bringing behind it all the flowers of summer, and ending up with a caboose of more pansies for Fall. Pansies are the sunrise of Spring in the garden and the sunset of Fall in the garden. Spring without pansies is like Lucy without Ethel and Fall without pansies is like Abbott without Costello. Suffice it to say, I buy pansies every Spring as soon as I can find them for sale and plant them in containers to put on my front porch. I leave them far too long in the heat of summer and eventually around the Fourth of July holiday, I unceremoniously dump them into the compost bins. Then every Fall I seek out new pansies to once again plant in containers for the front porch. I’ll leave them on the porch until around Thanksgiving, before they, too, end up as compost. What are your thoughts on pansies? The pansies are a winter annual here - so we'll plant them in late fall. With luck they'll bloom until May and the heat gets them. Carol - bet you know that Pansy comes from pensée , the French word for thoughts and that nice pun in the title was on purpose! Annie beat me to it! I was going to say the same thing...except the French part since I didn't know that! My goodness, that was beautiful, a tear jerking ode to the humble pansy. Me? My thoughts?.....I like 'em!! I'm waiting for the garden centers to get them in. I plant them in the fall and they last all through the winter, spring and early summer! Sometimes they reseed..
What's not to luv about those cute little pansy faces? It's nice to have something to plant in the fall. Well, I do have ALL those bulbs that still need planting but won't be able to enjoy the blooms for many months. My favorite thing about pansies, besides how delightful they are, is that here in KY I can plant them in the ground in the fall, they bloom until it gets really cold, then they sit dormant until spring when they come back to life bigger than what you can buy at the store and with a lot more blooms. Along with cosmos, they're my favorite flowers. Panzies in the fall colors are a great way to end our gardening season. I have had them last through several frosts and often are still blooming after Thanksgiving. HmmmI I think you like pansies. I do too, for all the same reasons. Hi Carol, I finally got the 7meme done that you requested. Our violas will be ready September 25 at Mouse Creek. We can't be without them. I love this post... but I confess that I don't like pansies! I don't know why. I tried to embrace them last fall (in a nice rich red color only) but then they came back this spring and absolutely haunted me through the summer, even. (It was such a cool summer, they kept blooming... while the poor snapdragons I had purchased to replace them wilted in their cell packs.) I think that they were trying to win me over, but it didn't work. I'm done with pansies! They're called "Pansies" because they can't take the heat. ;^) Pansies & I are a like, we both appreciate the cooler weather of spring & fall. Pansies were one of my grandmother's favourite plants, Carol, and so they're one of mine, too. Though I don't always plant them because they're slugbait up here in the wet soggy foggy Bay. Interestingly, I have lots of freerange Johnny jump ups all the time, and they do fine regardless. My fave pansies are called Antique Shades, though really I've never seen one I didn't love. I tend to have Johnny-jump-ups because they reseed readily for me. The pansies don't, very much. They never wind up on the compost pile. They are not in prominent positions, just weave through the other plantings, so when they get leggy I don't notice. Carol, if I were still teaching I'd use this post in my Creative Writing class as the perfect example of re-writing and re-writing:) I don't usually plant pansies in the fall, thinking I'm wasting money on something that won't last long. I may have to re-think that. In the spring, though, I always buy them--by that time, I'm ready for anything that blooms! Pansies are one of my favorites. I can never have enough. They are our winter and spring plants here. Your fun with words was fun for me. Being and old school teacher and a natural editor (one and the same? ), here's an editor's note on one of your tries. You said, "Pansies are the sunrise of Spring in the garden and the sunset of Fall in the garden." 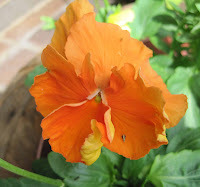 I would suggest, "In the garden, pansies are the sunrise of Spring and the sunset of Fall." I love pansies that bloom and bloom and bloom which doesn't happen very often. Like Black Swamp Girl, we had a very cool damp spring and early summer. My pansies are just now dying off. But I think I'll give them a pass next year anyway. I enjoyed your post! That's funny...my thoughts are the same about pansies. I love them in pots in the spring and fall. I guess I just need a compost for the in between times. I wished I had pansies...and then I can join you with a nice description of spring and autumn. I love pansies; use them in pots everywhere. Now I'm seeing signs saying 'time to plant pansies'..I'm going to try that too. pansies and gave it to a friend. They are still blooming in September! The pot I planted of the same for myself I killed by using a non-draining pot! Yes, I knew I was taking a chance but thought I would remember to not overwater... but it rained all the time this summer! I would enclose a photo if I knew how.